Our 18oz vacuum-insulated bottles keep liquids hot or cold all day. This compact size fits easily in your backpack and holds enough to keep you hydrated at the dog park or while out running errands. Or fill it up in the morning with enough coffee to fuel you through your commute and most (or even all!) of your work day. 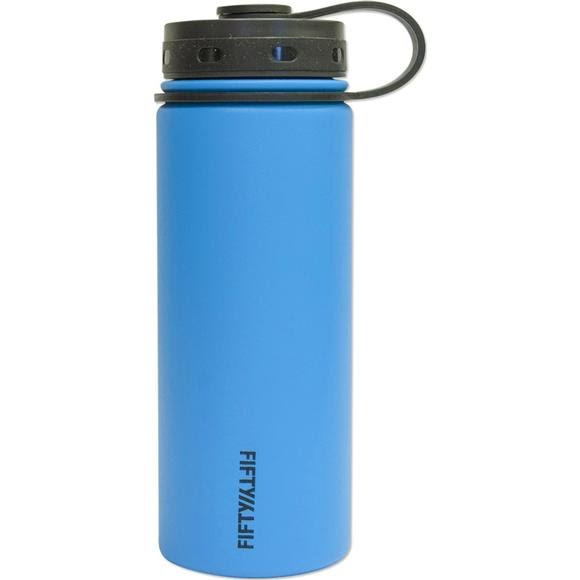 Our 18oz vacuum-insulated bottles keep liquids hot or cold all day. This compact size fits easily in your backpack and holds enough to keep you hydrated at the dog park or while out running errands. Or fill it up in the morning with enough coffee to fuel you through your commute and most (or even all!) of your work day. Available in a variety of fun color options, they&apos;re made of lightweight 18/8 stainless steel that is recyclable, non-leaching and will not retain taste or odor. And even better, the double-wall technology prevents condensation on the outside of the bottle so you don&apos;t have to worry about water rings on your coffee table.